IT might have only been day one but the Gold Coast Commonwealth Games delivered the drama. Sally Pearson's bombshell withdrawal made news around the world while Mack Horton's performance in the pool and Jake Birtwhistle flying home to get silver in the men's triathlon dominated headlines. 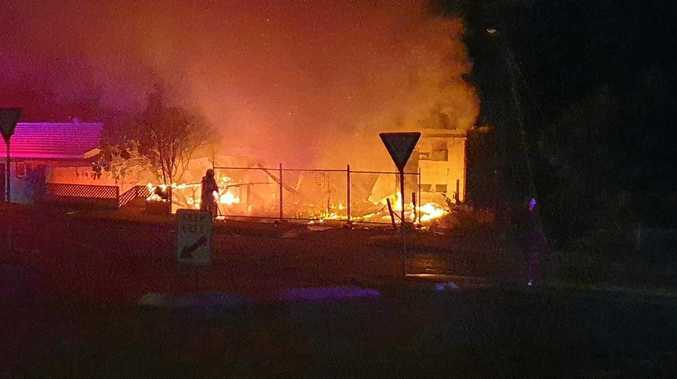 But if you think the action ended there ... think again. From small crowds to a bowls boilover for the ages and an awkward press conference exchange, catch up on drama filled moments from day one on the Gold Coast. We haven't seen drama like this on the lawn bowls greens since the final scene of Mick Molloy's movie masterpiece Crackerjack. In one of the greatest upsets in Commonwealth Games (bowls) history, the highly fancied Aussie men's triples team was beaten by the not-so highly fancied outfit from Jersey. To give a little bit of perspective on how the two nations have previously fared at the Games, in 15 appearances, Jersey has secured one gold medal while Australia is just ahead with 852. While it may have been only Round 1 and there is still plenty to play out in the tournament, there is no doubt there would have been a few supporters of Jersey dreaming of doubling that gold medal tally sooner rather than later. After listening to Tonga's Finau Ohuafi, no swimmer should ever complain about training conditions again. 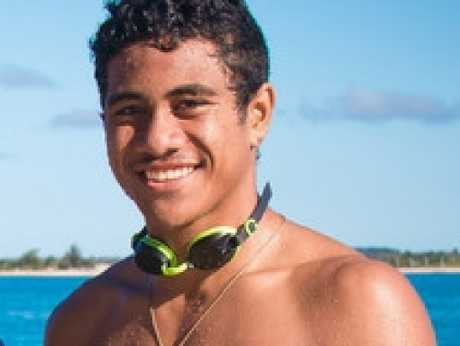 Ohuafi placed fourth in his 50m butterfly heat before giving an insight into his training conditions back home. "I'm not used to swimming in pools," he told reporters. "We don't have pools in Tonga. There is a 25m pool at a hotel where we go to train, but we swim in the sea. It's difficult because you don't have starting blocks. "For me it's nice to swim in the sea but one time me and my cousin were training we saw a shark." That's right, Ohuafi trains with sharks! No wonder the 17-year-old had no fear of any of his rival swimmers. It was the vision that would have had Games organisers very, very nervous. 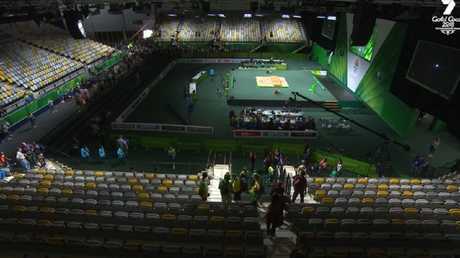 With Channel 7 showcasing some of the early morning weightlifting, the camera panned to a shot of the stadium. And boy, was it empty. There was barely an occupied seat in the house for the start of the opening session. Spectators were hard to find at the weightlifting event on the Gold Coast. Luckily, things perked up for the afternoon proceedings, with a strong and very vocal crowd getting right behind local hope Alyce Stephenson in the women's 48kg event. For a brief moment during the second round, Stephenson held the lead and it felt like the roof might burst off the Carrara Leisure Centre. However, the challengers rallied and Stephenson ended up missing a medal. It was by far and away the biggest talking point of day one. Competing at her home Games, Sally Pearson was forced to pull out because of an Achilles injury. Only hours earlier at the opening ceremony, Pearson completed the baton relay, sporting a massive smile on her face as she waved to the crowd. 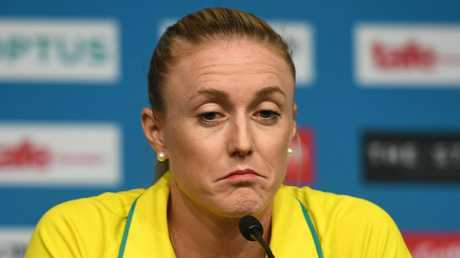 Sally Pearson announces her withdrawal from the Commonwealth Games. But not everyone was impressed with the way the Olympic champion handled things. At the injury press conference, a journalist from the BBC asked if Pearson felt she had been 'disingenuous' by taking part in the opening night celebrations. It would be fair to say it was an awkward vibe in the room after that. Ben Proud after he was disqualified from his 50m butterfly heat. It was the moment that left everyone poolside speechless and brought the Commonwealth Games its first sporting controversy. Everything was going perfectly for reigning world and Commonwealth champion Ben Proud, who flew through the water in the 50m butterfly heats. However, when he turned around to check his time, there was a big "DQ" slated next to his name. 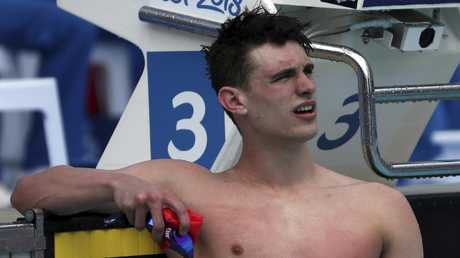 After breaking at the start, the British star was disqualified by swimming officials. Not only was everyone poolside stunned, even Aussie swimming great Ian Thorpe, who was in commentary, struggled to put into words what had happened. Thorpe could only muster cries of "no" and a "woah" from the booth. The moment may have brought back some bad memories for Thorpie, who almost missed his pet event at the 2004 Olympics after false starting at the Australian qualifiers. Luckily, Craig Stevens stepped aside and allowed Thorpe to walk away with Athens gold. You might struggle to find a more relaxed athlete at these Commonwealth Games than Uganda's Julius Ssekitoleko. Competing in the weightlifting and having twice failed to pick up the 67kg bar, Ssekitoleko strode out for his third attempt as if he was going for a Sunday stroll. With the time limit ticking down to just single figures, it promoted a contender for commentary call of the day. "Dude, on the bar. Come on, let's go," said the channel 7 presenter. Outstanding! But, like a university student who claims they do their best work under the pressure of a tight deadline, Ssekitoleko delivered the goods. Pressure…what pressure?! He lifted the weight and, as cool as he arrived, walked back to the change room.